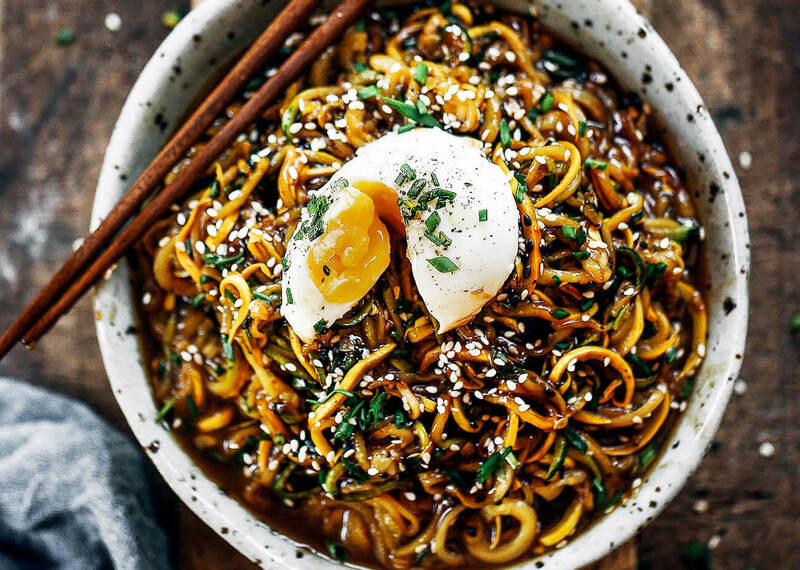 192 calorie whole30 balsamic glazed asian zucchini noodles! 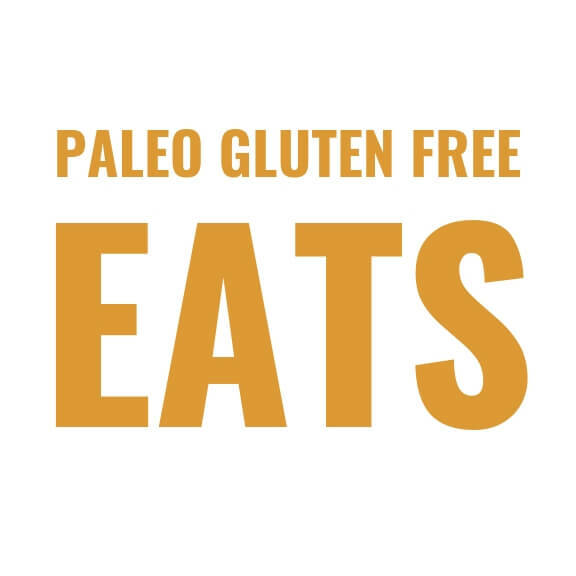 Super easy whole30 and paleo meal. A healthy dinner recipe for the whole family! 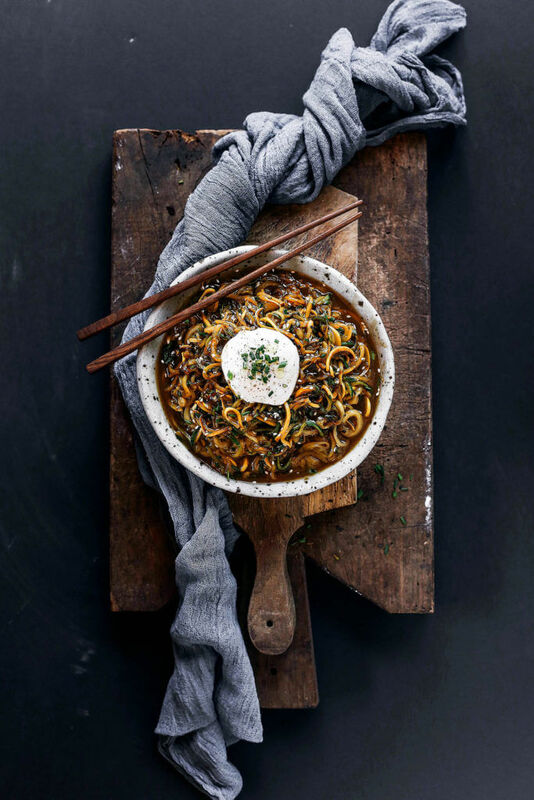 Kid friendly noodles with a tempting asian sauce. Ever play catch with the giant melon underwater? Yep, I hadn’t either until today. My family was prepping for a barbecue gathering with some friends and brought back a watermelon to dish out. It was supposed to make it to the freezer to be chilled in time for eating but it never made it there. My brother grabbed it and tossed it to me in the pool. Then we spent the next hour launching the giant watermelon underwater like a missile. All natural pool toys. You’re probably wondering what this scenario has to do with these noodles, right? Well, nothing really. Let’s just say the watermelon never made it to the dinner table, because when my brother brought it up out of the pool it dropped and turned into watermelon juice. End of story. Ooodles of noodles baby! This dish for ssian noodles is way healthier than a carb loaded bowl of starch. Instead, the green veg of the zucchini makes a light and refreshing meal. Leaving you feeling satisfied and not weighed down by calorie overload. So… this sauce… What can I tell you? It only takes a small handful of ingredients you probably already have around your house, which makes it a no brainer to make on weeknight dinners (at least around here). Nothing super fancy. Just loads of flavor! I made the sauce by thickening it on the stovetop for a few minutes and voila, dinner is served. Everything in the recipe is incredible easy to make. But make sure you have either one of these or one of these to make your zucchini noodles. P.S. This one is by far the best spiralizer and I highly recommend it!! 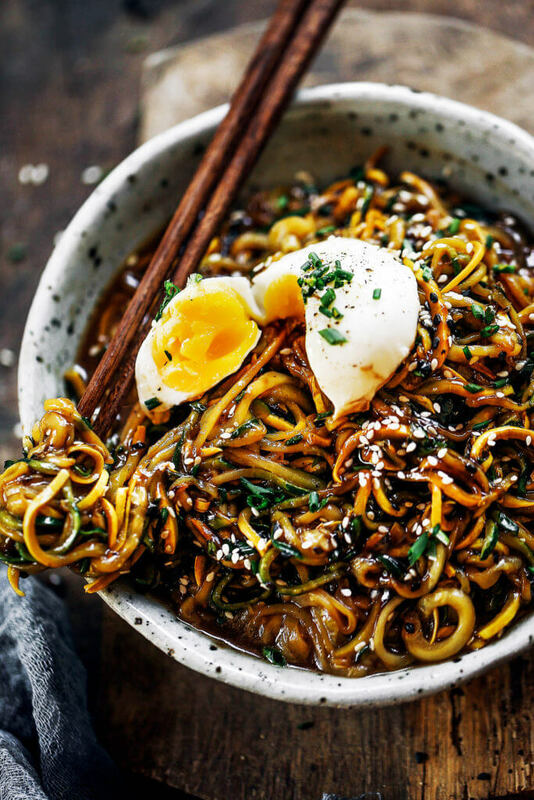 Begin by preparing your noodles with a spiralizer (read post to see which one I recommend). Heat a large fry pan over medium/high heat on the stove. Fry the noodles with 1 tablespoon sesame seed oil for about 3-4 minutes until softened. Then remove from the heat and set aside. Drain excess liquid. Prepare the sauce by incorporating the balsamic vinegar, maple syrup, coconut aminos, and hot sauce together in small sauce pan over medium heat on the stove. In a small cup mix the cold water and arrowroot flour together into a liquidy paste. Bring the sauce to a simmer then stir continuously while pouring in the arrowroot and cold water mixture. Continue to cook and stir the sauce (keeping it at a simmer) for a few minutes until the sauce thickens. Then take off the heat and pour over noodles. Top off with sesame seeds, chopped cilantro, chopped green onions, and a poached egg, if desired. Kaylie, this looks amazing! I think I’ll try this tonight…yay me I have everything I need at home. Question…where does the 5g of protein come from? The egg? Thanks so much, your fellow PNWer! This looks great! Is there a sub for the arrowroot, tapioca flour perhaps? The color of that noodle bowl is seriously making me so hungry. 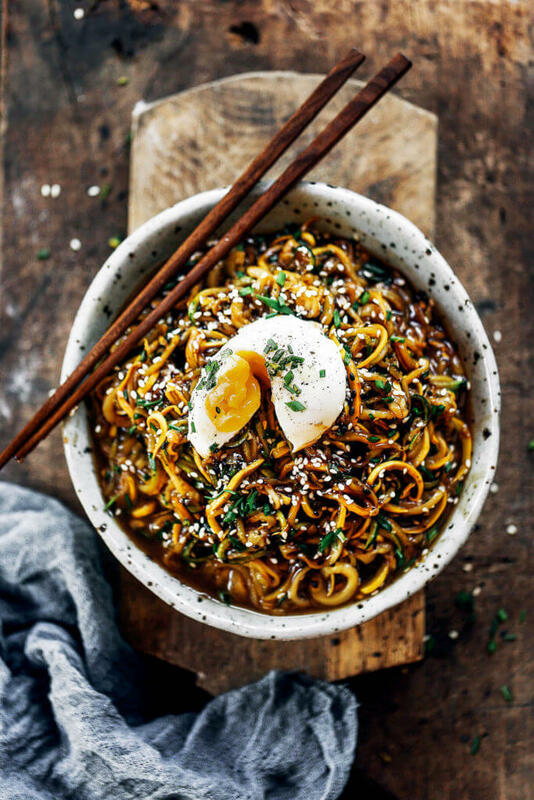 I love a noodle bowl but a rich brown sauce like that you made is ever so tempting! Made this for lunch today and it was delicious! Omitted the Maple Syrup and Arrowroot and it turned out great. The fresh herbs put it over the top! this recipe looks awesome! confused on the title of “whole 30” when the ingredients include maple syrup. can i skip or sub with something else? I made this and loved it! Great recipe, will continue to keep it on my “go-to” list =) Thank you! Shelf life of this dish? It can store in the fridge for probably 3 days. I just started Whole30 2 wks agos I am not sure can you use arrowroot flour, balsamic & hot sauce? Hi Patrica, yes- the brand Frank’s hot sauce is the one thats whole30 approved, and arrowroot used in a recipe like this is as well- same with balsamic. This was super good, but for the cooks among us who are not very intuitive (me) may I suggest adding to the directions that after you cook the noodles, you drain any excess liquid from the pan? My noodles still tasted good but it didn’t look as fabulous as it could have with the yummy sauce bc it was diluted. Thanks for the recipe! Just added it- thank you for the great feedback! Soo yummy! Super easy. Even my 11 year old sister and 8 year old brother loved it. Thanks!! i made the great date syrup (yum! ), but curious…is homemade date syrup whole30 compliant? i read in the “rules” that it wasn’t, but it didn’t specify what kind. Hi! Just can’t seem to find summer squash here at the moment.. can I use zuchinni and spaghetti squash instead? I’m not a huge fan of zucchini noodles (maybe because I haven’t mastered the cooking of them but they’re always to crunchy) can I just sub for spaghetti squash? Hi Catherine, that might work, but I suggest using tapioca flour instead or regular flour.